Russia has nominated its squad for the 2017 Confederations Cup. The tournament will include eight teams—the six continental champions, as well as the World Cup winners and the host. The host cities, for what has been traditionally been the curtain raiser of the World Cup, are Moscow, Saint Petersburg, Kazan, and Sochi (the full match schedule can be found here). 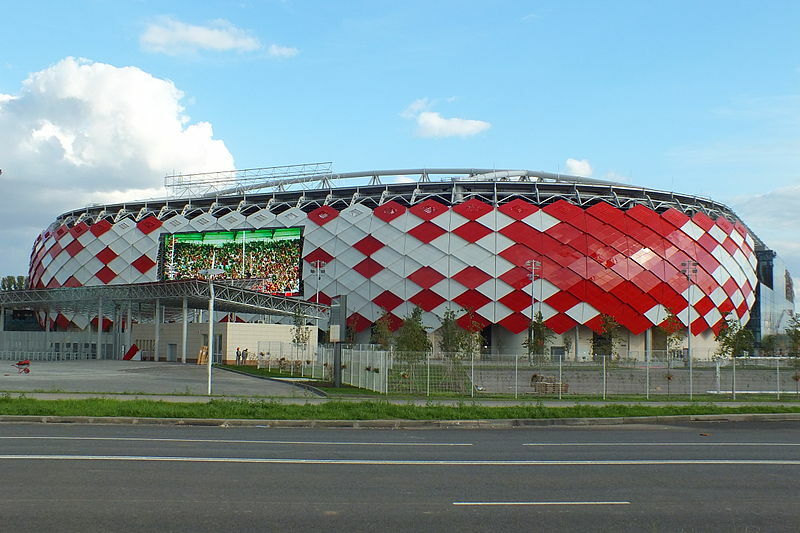 Spartak Moscow’s new home stadium the Otkritie Arena will host three group stage matches, and the third placed match. Opened in 2014, the Otkritie Arena was the first true football stadium opened since the Lokomotiv Arena was opened in 2002. The 45,000 seat stadium, in many ways, resembles the Allianz Arena in Munich and, with its steep stands, is a wonderful place to watch football. The stadium was built on the old Tushino Airfield, and is serviced by two Metro Stations—the newly built Spartak Station and Tushinskaya Station, which are both on the Tagansko-Krasnopresnenskaya Line, also known as the purple line. The new Zenit Arena on Krestovsky Island—the facility has also been referred to as Gazprom Arena or Krestovsky Stadium—has been one of the longest lasting stadium projects in history. Construction originally started in 2007, and was supposed to be concluded in 2009. Numerous delays and construction problems have meant that completion of the project is expected in December 2016 (more on the construction project, as well as pictures can be found here). The delays have meant that the facility is now the most expensive stadium ever built, with the current costs to be estimated around €1 billion—in comparison the Allianz Arena in Munich cost a third of the price. That said, once it is finished, the facility will be magnificent. The stadium will host three group stage matches, including the opening game, as well as the final. The stadium can be reached easily from downtown Saint Petersburg via the Metro—Krestovsky Ostrov station off the purple line. 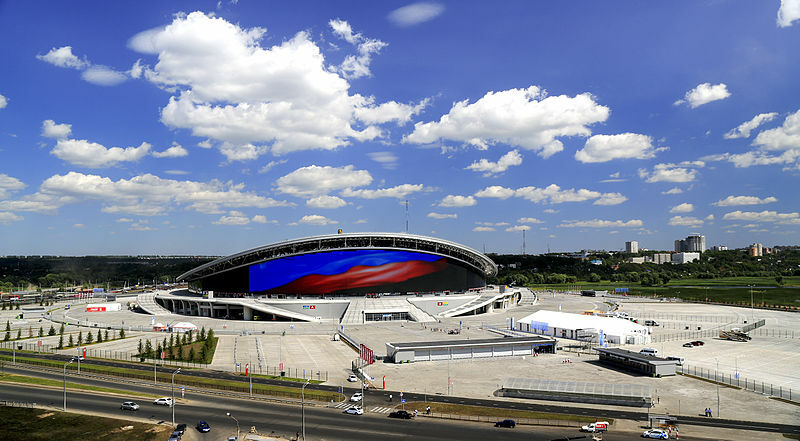 The Kazan Arena was opened just in time for the 2013 Summer Universiade, and is now the home ground of Rubin Kazan. The stadium has 45,000 seats, and will host three group stage matches as well as one semi-final. Although Kazan’s Metro opened in 2005, the stadium cannot be reached with the Metro, and is instead serviced by express busses, which run from the city centre and the Kazan Kremlin (check out rusavtobus.ru for directions). The Fisht Arena was built for the 2014 Winter Olympics, and the stadium will host three group matches, as well as one semi-final. The Fisht Arena will be the only stadium at the tournament that is not home to a Russian Football Premier League side. The stadium itself is located 33 km south of Sochi in the Olympic Village built in Adler. Adler is located next to the boarder of Abkhazia, which declared independence from Georgia following the 2008 war between Russia and Georgia. The territory remains disputed to this day and, together with the fact that Sochi is in close proximity to both Dagestan and Chechnya, there have been security concerns over holding sporting events in the city. This will be the last set of competitive games for Russia before the World Cup kicks off in earnest in the summer of 2018. Stanislav Cherchesov took over the Sbornaya after a poor showing at the 2016 European Championships in France. Cherchesov has bloodied a few new players, but results have been far from convincing. The Sbornaya drew Turkey 0-0 in Cherchesov’s first match, and then beat Ghana 1-0. The Russian national team then lost in spectacular fashion to Costa Rica (3-4), and then completely embarrassed itself when they lost 2-1 to Qatar. The Sbornaya redeemed themselves somewhat when they beat Romania 1-0 in their latest friendly. The matches highlighted the fact that that Cherchesov still has a mountain to climb when it comes to building a team that can be competitive at the 2018 World Cup. Zenit’s forward Artem Dzyuba is the squad’s biggest star. The sizeable Russian striker has often been described as Russia’s Zlatan Ibrahimović but, while the two share some physical traits, comparing Dzyuba to Ibrahimović would do the Swedish star striker some disservice. Other players to look out for include Fedor Smolov, who won the goal-scoring title last season, and this year has scored nine goals in nine games leading the goal-scoring race once again. Also, look out for Aleksandr Kokorin, who has revived his career under new Zenit coach Mircea Lucescu, and CSKA Moscow midfielder Alan Dzagoev. New Zealand qualified for the tournament, as the champion of the Oceania Football Confederation (OFC). The OFC championship is generally considered the weakest of the continental championships and has further decreased in value after Australia joined the Asian Football Confederation in 2005. New Zealand reached the tournament by defeating hosts Papua New Guinea in the 2015 OFC championships. Olympique Marseille prospect Bill Tuiloma, spent last season out on loan at the Ligue 2 club RC Strasbourg, was the first New Zealander to play in the French Ligue 1 when he was brought off the bench on February 7, 2015. Of Samoan decent, Bill Tuiloma had trials with Queens Park Rangers and LA Galaxy before making the move to France. The Portuguese A Seleção surprised the world last summer when they stunned France in the final of the UEFA Euro 2016 to take the European continental crown. Portugal’s victory brought about criticism of the European Championship format, as the A Seleção only won one game in regulation time on the way to the final—a 2-0 win over Wales. Portugal reached the knockout stage after drawing three games in the group stage, and only advanced, because of a controversial switch of the tournament format. The title was the crowning achievement for superstar Cristiano Ronaldo. It is hard to look beyond Cristiano Ronaldo, as the Real Madrid forward is the most prolific goal scorer of his generation. Other players to look out for include 19-year-old Bayern München midfielder Renato Sanches, Inter Milan playmaker João Mário, and AS Monaco’s Bernado Silva. Mexico qualified by winning the 2015 CONCACAF Cup—a playoff between the 2013, and the 2015 Gold Cup champions—against the United States in October 2015. Mexico hosted the 1999 edition of the Confederations Cup, and ended up winning the tournament in a dramatic 4-3 final against Brazil. Mexico reached the quarterfinal of the Copa América Centenario in the United States, but were demolished 7-0 by the eventual tournament winners, Chile. Javier Hernández better known as Chicharito is far and away the country’s biggest football star, and the prolific goal scorer, who plays in the Bundesliga for Bayer Leverkusen, will have to be on form if his country wants to go far in the tournament. Also, look out for Marco Fabián, as the technically gifted playmaker has been the cornerstone of Eintracht Frankfurt’s success this season. Other players to watch out for include Porto’s Miguel Layún, who has been linked with a move to Dortmund, and midfielder Héctor Herrera. Cameroon was the last team to be included in the tournament. The African nation won the 2017 African Cup of Nations in Gabon. This is the third tournament for Cameroon, who have taken part in the 2001 and 2003 editions of the Confederations Cup. For years the country was depended on superstar striker Samuel Eto’o. The striker, who has played in Russia for Zenit, however, has retired from the national team, and Cameroon has rebuilt the squad. It was, therefore, a surprise when Cameroon won the title in Africa earlier this year, and the African country will be the biggest outsider in Group B.
Vincent Aboubakar is the country’s biggest star. On loan from Porto Aboubakar has scored ten goals in 23 games for Beşiktaş in Turkey. A striker with a strong physical presence Aboubakar will be the country’s danger man. La Roja finally won their first trophy when the country hosted the Copa América in Chile in 2015. The final against Argentina could not be beaten in terms of drama, at least that is what people believed until the two countries faced off once more in the 2016 Copa América Centenario final. Both times, Chile and Argentina battled one another all the way to penalty kicks, and it was only thanks to the heroics of Chile keeper Claudio Bravo that Chile lifted the trophy on both occasions. Since winning the title, however, Chile struggled somewhat in World Cup qualification, and are in danger of losing out on reaching the 2018 World Cup in Russia. La Roja picked up a vital three points against Uruguay in the last round of World Cup qualifying, and are currently fourth in qualification—the first fourth in a tight qualification group. FC Bayern München midfielder Arturo Vidal is the country’s biggest star. Nicknamed der Krieger (warrior) in Germany, Vidal has a reputation both for being tough on himself and on his opponents. But to limit the midfielder to just his physical play would not do him justice, as he is also technically and tactically gifted, and with his leadership ability, he can push a team forward. If Vidal is the leader on the field, Arsenal’s Alexis Sánchez is the creative spark moving forward. The forward has now scored 36 goals for his country, only one goal behind Chile’s all-time top scorer, Marcelo Salas, who has 37 goals. Australia qualified for the Confederations Cup by hosting and winning the 2015 AFC Asian Cup. Australia defeated South Korea 2-1 after extra time. The country made the switch from the OFC to the AFC in 2005, hoping that playing in the more competitive Asian Football Confederation would help to develop football in the country. The results have been positive, as Australia managed to qualify for the 2006, 2010, and 2014 World Cup, and were runners-up of the 2011 AFC Cup, and then won the 2015 edition. Finally, this is the third time that Australia participates at the Confederations Cup—they were runners up in 1997, and finished third in 2001. Massimo Luongo won the player of the tournament award at the 2015 AFC Cup. The 24-year-old midfielder plays for Queens Park Rangers in England’s Championship. Another player to look out for is Bayer Leverkusen’s Robbie Kruse, who has been in and out of Bayer’s squad for the last two seasons. The winger has plenty of pace, but has been somewhat hindered by several injuries. The World Champion will likely send a weakened squad to the Confederations Cup, as Bundestrainer Joachim Löw wants to rest several stars next summer and also would like to test some younger prospects. German football seems to have an endless conveyor belt when it comes to producing young and talented footballers, which means that Die Nationalmannschaft will still field a highly competitive team. Just how deep is German football? A good indication is the Olympic tournament in which Germany used (to their standards) a very limited side, which came within one penalty of winning gold against what was a highly talented Brazilian side. Hence, even without some of their biggest star names, Germany will still likely be one of the favourites to win the tournament. Expect the likes of Mesut Özil, Thomas Müller, Manuel Neuer, and Jérôme Boateng to sit this one out. Instead, look out for Leverkusen’s Julian Brandt, Hoffenheim’s Niklas Süle, and RB Leipzig’s Timo Werner. Süle and Brandt were key in Germany’s run to the Olympic final in Brazil, and Timo Werner has scored 20 goals in the Bundesliga this season. Finally, there will likely be a few names, which are still relatively unknown. Someone, who could feature prominently is Bayer Leverkusen’s Benjamin Henrichs, who recently debuted for Die Nationalmannschaft against San Marino. One year before hosting the 2018 World Cup, Russia will have to show the world that they are ready to host the world’s biggest sporting event. There are still question marks over some stadiums in the country. 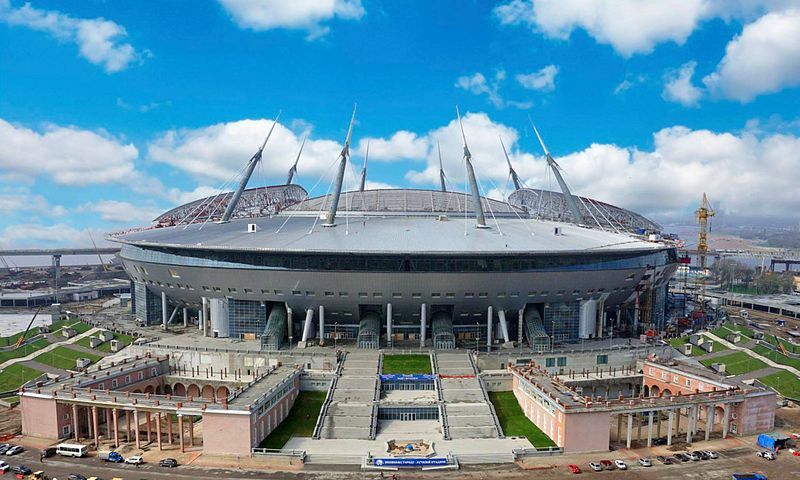 There are several stadiums that are still in the early stages of construction and, while the Zenit Arena in Saint Petersburg will be the only currently unfinished stadium to be used next summer, other facilities in places like Kaliningrad, Samara, and Volgograd are still far from completed. There have also been plenty of comparisons between Brazil, and Russia. In terms of infrastructure, these comparisons are certainly fitting, as the countries are on a similar trajectory in terms of development. The infrastructure for the tournament in Russia seems to be slightly further along than Brazil was at the same time in their preparations. 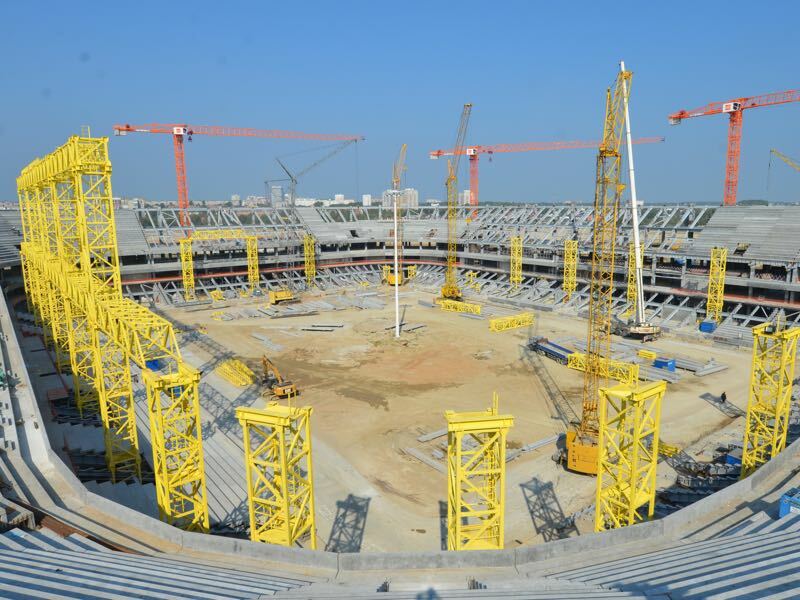 A scenario in which a World Cup stadium will be unfinished by the time the tournament kicks off, as was the case with the Corinthians Arena in São Paulo that hosted the opening game of the 2014 World Cup, is unlikely to repeat itself in Russia. 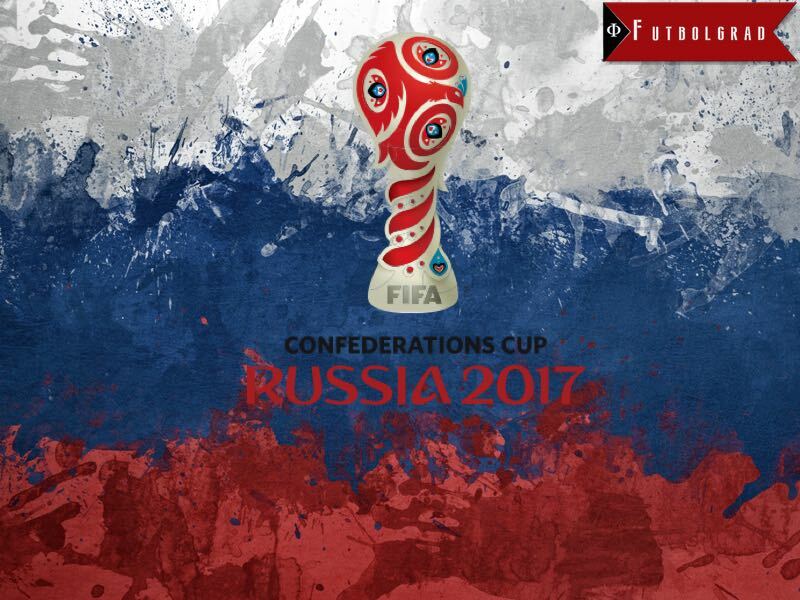 Furthermore, the political turmoil experienced during the 2013 Confederations Cup, is unlikely to be repeated during the 2017 Confederations Cup in Russia, as most people in Russia seem to be behind the politics of President Vladimir Putin. 2018, however, will be an election year in Russia, and with the election of Donald Trump in America, and the continued involvement of Russian troops in Syria, and Ukraine, it is difficult to foresee the political and economic impact of the tournament on the Russian Federation. Gonna be an exciting tournament ahead of 2018 world cup. Hopefully Germany wins 2017 FIFA Confederations cup.